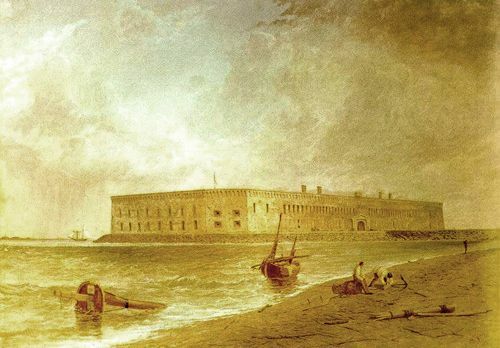 Best known for being the site upon which the shots initiating the American Civil War were fired, Fort Sumter was built following the War of 1812, as one of a series of fortifications on the southern U.S. coast. Named after General Thomas Sumter, Revolutionary War hero, building began in 1829 when 70,000 tons of granite were imported from New England to build up a sandbar in the entrance to Charleston harbor, which the site dominates. The fort, itself, was a five-sided brick structure, with walls about 180 feet long, five feet thick and 50 feet tall. It was designed to house 650 men and 135 guns in three tiers of gun emplacements, although it was never filled near its full capacity. As with many Federal projects, enslaved laborers and craftsmen were among the men who worked on this structure. The fort was still unfinished when Major Robert Anderson moved his 85-man garrison into it on December 26, 1860, setting in motion events that would tear the nation asunder four months later. 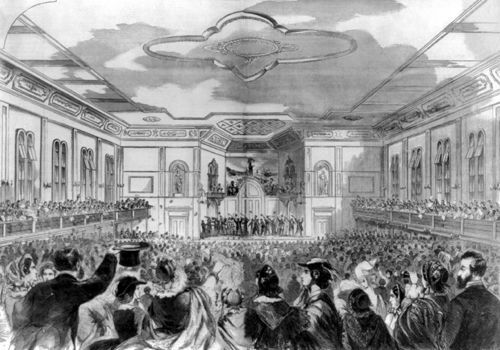 On December 20, 1860, South Carolina delegates to a special secession convention voted unanimously to secede from the Federal Union. In November, Abraham Lincoln had been elected President of the United States with no support from southern states. The critical significance of this election was expressed in South Carolina’s Declaration of the Immediate Causes of Secession: “A geographical line has been drawn across the Union, and all the States north of that line have united in the election of a man to the high office of President of the United States, whose opinions and purposes are hostile to slavery.” The Declaration claimed that secession was justified because the Federal Government had violated the Constitutional compact by encroaching upon the rights of the sovereign states. As the country expanded, regional conflict centered on the extension of slavery into new American territories. Included in the arguments was the fate of enslaved African Americans fleeing from the South. Over decades, North and South tried and failed to reach agreements on geographic boundaries for slavery, the recapture of runaways, and the status of free blacks living throughout the nation. National political parties, religious denominations, and even families divided over these issues. In the months between Lincoln’s election and his inauguration, as more southern states proclaimed secession, efforts at compromise continued. Southern Unionists and their northern supporters believed that the Union could be restored without war if only the southern states had guarantees that the Federal Government would not interfere with their slave property. A Constitutional amendment guaranteeing the rights of slave owners was suggested, but Lincoln concluded that no plan of compromise would ever fully satisfy South Carolina, the state that led the South in defense of the rights of slaveholders and the right of secession. Within six weeks after South Carolina’s secession, five other states — Mississippi, Florida, Alabama, Georgia, and Louisiana — followed its example. Early in February 1861, delegates met in Montgomery, Alabama, adopted a constitution, set up a provisional government — the Confederate States of America — and elected Jefferson Davis as their president. By March 2nd, when Texas officially joined the Confederacy, nearly all the Federal forts and navy yards in the seven seceding states had been seized by the new government. Fort Sumter was one of the few that remained in Federal hands. When South Carolina seceded, there were four Federal installations around Charleston Harbor: Fort Moultrie on Sullivan’s Island, Castle Pinckney on Shute’s Folly Island near the city, Fort Johnson on James Island across from Moultrie, and Fort Sumter at the harbor entrance. 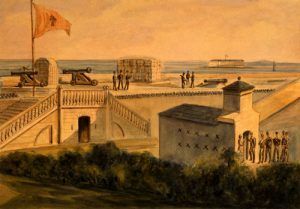 The only post garrisoned by more than a nominal number of soldiers was Fort Moultrie, where Major Robert Anderson commanded two companies, 85 men, of the First U.S. Artillery. Six days after South Carolina seceded, Anderson concluded that Moultrie was indefensible and secretly transferred his command to Fort Sumter, a mile away. On December 27th, South Carolina volunteers occupied Fort Moultrie, Fort Johnson, and Castle Pinckney, and began erecting batteries elsewhere around the harbor. South Carolina regarded Anderson’s move as a breach of faith and demanded that the U.S. Government evacuate Charleston Harbor. President James Buchanan refused and in January 1861, attempted a relief expedition. South Carolina shore batteries, however, turned back the unarmed merchant vessel, Star of the West, carrying 200 men and several months’ provisions, as it tried to enter the harbor. Early in March, Brigadier General Pierre G. T. Beauregard took command of the Confederate troops at Charleston and pushed work on fortifying the harbor. As the weeks passed, Fort Sumter gradually became the focal point of tensions between North and South.